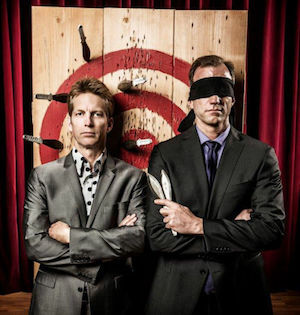 Comedy duo The Passing Zone will bring their award-winning combination of dexterity, danger, and hilarity to Pepperdine University’s Smothers Theatre on Sunday, April 22, at 2 PM. The Passing Zone, comprised of Owen Morse and Jon Wee, is one of the most successful and sought-after comedy acts working today. Morse and Wee met in 1986 at a juggling convention while they were both in college, and instantly knew they were destined to be a team. Two weeks after their first performance together they won the Silver Medal at the International Jugglers’ Association (IJA) Teams Competition. The next year they won the Gold. That recognition earned the duo an invitation to appear at the renowned Comedy and Magic Club in Los Angeles, where on their first night they were approached by The Tonight Show talent scout and booked for their first national television appearance in September 1990. Their first feature film followed, The Addams Family Movie, where Morse and Wee doubled for Gomez (Raul Julia) and Uncle Fester (Christopher Lloyd) in the climactic Mamushka dagger-passing scene. This was followed by an appearance in the award-winning comedy documentary, The Aristocrats. The Passing Zone’s first London appearance was in the Royal Variety Performance at the Dominion Theatre, performing for Prince Charles and sharing the bill with Tony Bennett and Riverdance. The Passing Zone has also performed at the White House. Morse and Wee are known as much for their comedy as their juggling skills. They were featured twice on the gala stage at the Just for Laughs Comedy Festival in Montréal and have opened for comedians George Carlin, Bob Newhart, Bob Hope, and Penn & Teller. Television appearances have included Comic Strip Live, An Evening at The Improv, MADtv, Penn & Teller’s Sin City Spectacular, Steve Harvey’s Big Time, the Miss America Pageant, Seasons 1 and 11 of America’s Got Talent, and regular returns to NBC’s Today talk show. Morse and Wee were also commentators on ESPN for their coverage of the World Juggling Federation competitions. The group has received numerous awards and recognitions. They are the first juggling duo to ever pass 11 clubs, and hold five Guinness World Records and 18 Gold Medals from the IJA. They are also recipients of IJA’s Award of Excellence, given to only 13 acts worldwide since the organization’s inception. In their newest show, “The Passing Zone Saves the World,” Morse and Wee attempt to take on the troubles of life through power of infectious laughter and the thrill of dangerous stunts involving a stun gun, chainsaws, ping pong balls, and more. Ticket prices range between $10 and $35. For additional information about this performance, and to purchase tickets, visit the Center for the Arts website.